"The Auks’ defense was all over the Hornets to start the second quarter, and Catherine McGonigle and Bella Angiullo each hit a three-pointer as the Auks extended the lead to 24-10. The Hornets got a 3 pointer from Erica Hager, but the Auks took a 28-15 lead at halftime. The defense just kept up the pressure in the second half, and Stewart and McGonigle both scored old-fashioned three-point plays. 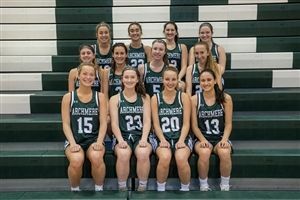 It was 34-19 Archmere after three quarters." The Auks, now 11-7, host St. Elizabeth on Tuesday at 6:15 pm. For pictures and to read the full article, click here.